Discover our history, corporate structure and philosophy. 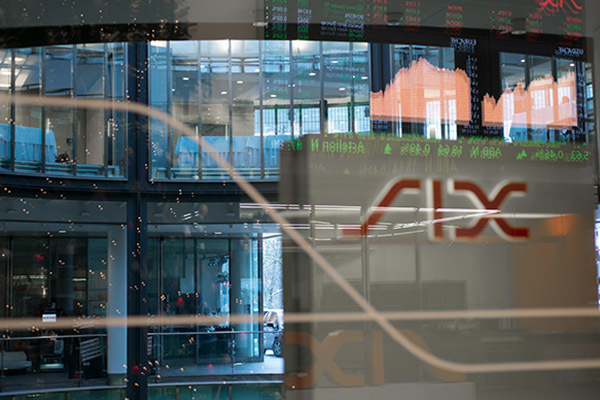 Swissquote Group Holding Ltd is listed on the SIX Swiss Exchange (symbol SQN) since May 2000. The Swissquote Group is fully committed to meeting the highest standards of corporate governance and acts in compliance with the standards established by the "SIX Swiss Exchange Directive on Information Relating to Corporate Governance". Find our more with our latest and former media releases and images or contact us. We are always looking for new talents. Check out our open positions. Apply for a job or register to be informed of our new opportunities. CFDs – versatile trading instruments. Download or log into your platform of choice. Take the lead with us. Develop your FX business. Become an Introducer. The Swiss economy is in excellent shape. Unemployment rate remains at decade-low, manufacturing PMI, an indicator of Switzerland economic activity, stands in growth territory while the ETH-issued KOF economic indicator is encouraging, thus suggesting above-average economic growth by year-end. In that respect, Swiss export numbers come back into the spotlight as Christmas holidays are approaching. Indeed, despite weaker backlogs from Swiss companies according to soft data estimates, the Swiss exporting industry is recovering in October. Highest since December 2016, the gauge rose by +6.30% on a month-to-month basis. Key support for the recovery were Chemical & Pharma products, which reached CHF 9 billion (+15.80% m/m) in exports, adding CHF 937 million of trade surplus. Overall, trade balance is given at CHF 2.6 billion (exports: CHF 18.90 billion; imports: 16.2 billion; September trade balance: CHF 1.27 billion). Swiss leading watch industry exported a total of CHF 1.75 billion (+4.20% m/m and + 7.20% y/y) worth of goods while the demand for jewelry declined slightly to CHF 905 million (-9.6% m/m). Most imported products were chemical & pharma (CHF 3.83 billion), machinery & electronics (CHF 2.78 billion) and vehicles (CHF 1.48 billion). Despite strong trade headwinds, which continue to weigh on the entire global economic outlook, key trading partners have been intensifying purchases of Swiss-manufactured products, including Europe +7.60% and Asia +3%, rising by CHF 774 million and CHF 126 million respectively in absolute terms. North American partners demand, on the contrary, lightly declined by -0.5% (CHF -17 million) due to a drop in Canadian orders (-10.5%) whereas US shipment even improved by +0.70% or CHF 21 million (US accounting for 90% of North American trades). Accordingly, despite underperformance of the financial market globally, including the US, whose year-to-date performance recently reached negative numbers, the Swiss stock market, due to its undervaluation and solidity, remains a good bargain. We remain confident that Swiss economic growth should stay on course and come up above historical average (1.80%), along 2.90% by 2018. As for 2019, economic growth indicators are expected to decelerate globally, since geopolitics and monetary policy normalization, as a result of tightened financial conditions, should mitigate world economic growth. © Swissquote 2019. All rights reserved.